Earn either undergraduate or graduate level credit by taking a course instructed by the authors, Paul M. Bingham and Joanne Souza. We explore in detail the new theory of human uniqueness described in Death from a Distance and the Birth of a Humane Universe. We re-examine all the vast repertoire of knowledge from the evolutionary and social sciences from an exciting new perspective. See how the natural and social sciences can be united for the first time - while we learn to think critically together and explore the art of scientific investigation. - Approved content component of the Stony Brook University Biology MAT program. - The Biology of Being Human (CEB553), 3-credit course, now available world-wide online. Course content given via broadcast quality video lectures. - Can be taken by teachers for Master's and advancement credit with your institution's approval. - See here for information and registration for the online graduate course (CEB 553). - All students (you do not have to be a Stony Brook University Student). See here under On-line Extended Session listing for information and to register for the summer extended session online course (BIO 358). - Take advantage of the opportunity to take a Stony Brook University Upper Division Biology course during the summer term at state university pricing. Check with your institution and major for transfer approval. - Stony Brook University Students only See SOLAR for information for class listings for the live lecture course (BIO 358). For faculty wishing to teach the content in Death from a Distance and the Birth of a Humane Universe, please contact the authors. 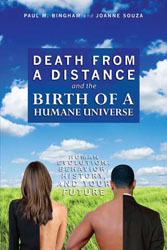 It is not often that readers are offered a new theory of human existence encompassing our origins, our unique properties as biological creatures, the agricultural revolution, and the rise of modern states, but this book promises just that. The authors argue that the first humans of two million years ago evolved the capacity to throw stones accurately and thus kill conspecifics from a distance. This capacity for "law enforcement" allowed unrelated individuals to cooperate in ever larger aggregates, thus forever altering the social environment and paving the way for democratization on a global scale. Such bold claims require strong support. The authors are diligent in building their foundation, even if some of their premises can be challenged. This book is surely provocative. Reading it carefully is well worth the effort.